It has been called an obsession, maybe it is an addiction, but most likely it is just plain old gluttony.I do love good chocolate! I have never trained in pastry, in fact I didn’t go to a catering college at all, but the dessert side of my cooking has always been really important. I have always regarded it as being the last impression so it needs to be as good as everything that went before. At certain times of year the pastry chef is totally spoilt with fresh produce, but in the early part of the year it can be a challenge. Forced Yorkshire rhubarb and blood oranges are the highlight but there is not too much else to excite, so things like spices, dried fruits and, of course, chocolate come to the fore. 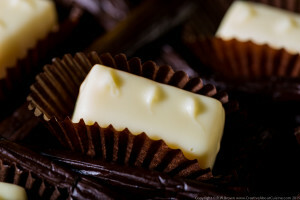 White chocolate is often underrated, but high quality white chocolate I think is a different matter. Brands such as Valrhona, Callebaut and Chocovic all produce white chocolates with high amounts of cocoa butter and dairy, some with vanilla as a flavouring. Vegetable fat instead of cocoa butter is a thing to avoid. These chocolates have distinct flavour profiles but they are delicate and as such do make good flavour carriers. The high quality white chocolates also contain less sugar so aren’t so sickly. 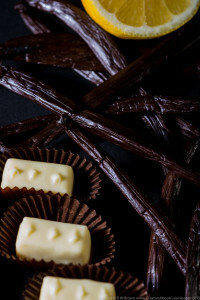 Creme brûlées, mousses, cakes, cookies and creams can all be made with white chocolate. A white chocolate brûlée with fresh strawberries is a thing of joy, and flavours such as lemon, vanilla or coffee can work well too. 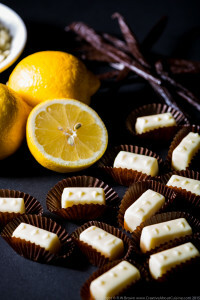 These lemon and vanilla chocolates are ones I served at Sienna as petits fours. The ganache is rich and creamy but balanced by the acidity, the vanilla gives depth to the flavour, and if you splash out on Tahitian vanilla you will get some amazing aromatic, floral notes too. Measure the cream into a heavy-based saucepan, then split the vanilla pod lengthways and scrape out the seeds, adding both to the cream. Grate the lemon zest directly into the pan (a lot of the flavour is in the oil and you want this to spray into the pan as you grate). Bring the cream just to a simmer, remove from the heat, cover and allow to infuse for 30 minutes. Pass the cream through a fine sieve into a clean pan and make the weight back up to 125g with water. Melt the chocolate. Warm the cream and add the butter. Emulsify the cream mix into the chocolate and add lemon oil, and little citric acid dissolved in a teaspoon of water to taste. Add the citric acid solution gradually; it doesn’t want to be too sharp. Warm the ganache to 45℃ either on a low power in the microwave or over a bain-marie, then place the bowl in cold water and stir until the mix reaches 28℃. Pour into a clingfilm-lined tray to set for 24 hours. To finish the chocolates, spread a layer of melted chocolate over the top surface of the ganache, chill briefly to set and then invert onto a sheet of silicone paper, remove the tray and clingfilm and coat the second side. 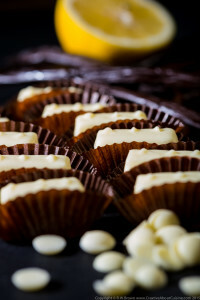 Once set use a warm dry knife to cut into squares ready for dipping in tempered white chocolate. Sounds delicious and just what I’m looking for – can I use it to ganache a large cake do you think? Would it work just cooling it then spreading it on? Can this ganache be used to cover a cake and then frozen?